I wonder if the owner of the above business ever uttered statements like these. I’ll bet he probably did. The big deal to me about this isn’t the resistance to new media. Yes, I’ve heard statements like the one above and I don’t agree with any of them for a variety of reasons. But there’s a far bigger problem with all of those statements – can you spot it? Their distributors, vendors and strategic partners. Evolution of your business is vital to survival but even more importantly, a resistance to listening to those who would support your products/services through either their dollars or their labor is one of the greatest sins of a marketer I can think of. Again with the We statements. I statements. Us statements. Remember, this doesn’t apply merely to your customers. It applies to the fellow in the mailroom who has been a part of your culture for the last 10 years. The guy who walks the floor of your business who also happens to get invited to after-work happy hours and interacts with the rest of the team. He could be just as connected to the real sentiment of the company than you are because, let me guess, you’ve got more “important” things to worry about. By the way, it doesn’t mean everything you develop as a product or service has to rely strictly on their opinion here and now. You can actually project what you think they’ll want. But that comes from knowing and understanding their innermost behaviors. What does their day look like? What are their challenges? How does your brand fit into that agenda and help them through it? It’s possible for long-established businesses to lose their way and forget this stuff. 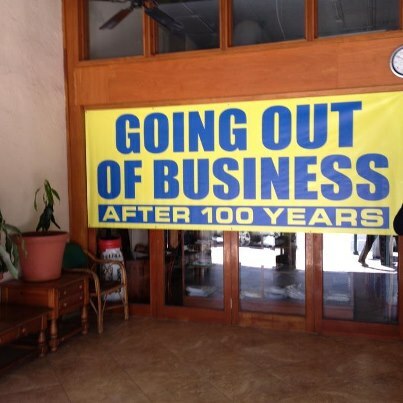 After all, the guy who started a business 100 years ago left the business – and this world – long ago. And then it changed hands from one generation to the next. The reality is that every business has an Evolution Window. In that Evolution Window, the business has the opportunity to re-evaluate, modernize, even possibly re-invent itself. It’s more than a new chapter – it’s a real moment of truth that defines the next era. Sometimes the Evolution Window is due to external trends at work, such as new technologies in the social media realm that present themselves or changing tastes and behaviors of the target audience. And many times it can be a combination of several factors in play simultaneously, both internal and external, that influence each other. Do they face a choice of Evolve or Die? Not always. More accurately, the choice is Evolve or Exist. Because there are a whole lot of companies that are evolving and others that are going through the motions. They’re not officially dead. Yet anyway. They’re just thinking that existing is the same as being successful. And it’s not. Not even close. These Existers are easy to spot. They’re not questioning if it’s time for change. They’re not learning. They’re not integrating. They’re not evolving. Instead, they’re waxing nostalgic about the only methods they’ve known and talking about the good old days before the new stuff came along. And they sure aren’t listening hard enough to voices other than their own. It may not happen right away, but when they miss the Evolution Window, they shouldn’t be surprised why, after all these years, they have to trim their staff or close their doors. It’s actually a fate worse than death. Because if your business dies, at least you have a chance to figure out where you went wrong from failure quicker and create a new entity that’s learned from past mistakes. Existing without evolution is just being on life support. Congratulations. You have your name on the door and provide the same services as everyone else. Punch in, punch out. Repeat until retirement or business closure. Committees can be bureaucratic and ineffective at their worst, but it’s certainly a good idea to have a group of people (non-title specific) who study the tools and trends affecting your industry and report back to upper management on a monthly or at least quarterly basis. Agencies and consultants, where appropriate, can only help provide insight and in turn, an extra value to their own services. It becomes more than just creating ads or blog posts or public relations tactics but actually helping the client create a better culture, product, operational structure and more. I personally love being a part of that process. Every business has their Evolution Windows. You might be seeing one right now. Which means there’s no time like the present to get the right people on board to help plan for adjustments. Because when that window closes, there’s no telling what else can close with it.